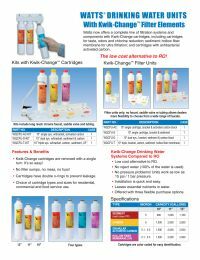 The Watts Kwik-Change cartridges are easy to change with just a single turn. No filter sumps, no mess, and the double O-rings prevent leakages. Cartridges connect directly to the unit by a simple 1/4 turn. Filter housings are eliminated. No mess during cartridge replacement! Internal valves shut off flow when cartridges are removed. Compact design, so the unit requires less space below your sink. This filter is not compatible with the Watts Premier RO-4. Product Note: This filter will NOT fit the Watts Premier RO Pure RO-4 System. If you have one of these systems please order part number 105351.